A delivery man left several cartons of milk and rice cereal at Huaibei Road Fire Brigade in Shijiazhuang, Hebei province. The gifts came with a note that said, "Toughest firefighters, promise me to come back safe and sound after every mission." On the same day, Fuqiang Street Fire Brigade in Shijiazhuang also received 14 boxes of milk tea and yogurt from an anonymous person, along with a note that said, "Protect yourselves and return safely. You have safeguarded people, and people will safeguard you, too!" The public outpouring of compassion came after 31 people died in a forest fire in remote mountains in Sichuan province on March 31. The dead included 27 firefighters and four locals. "When we saw the gifts and notes, everyone was deeply touched," said Wei Zishuai, 32, commander of the Huaibei Road Fire Brigade. "All our hard training and sacrifices are not in vain," Wei added. Sending anonymous gifts and sentimental notes has quickly spread across the country as a way to express people's gratitude toward the firefighters and wishes for their safety. "The car has been maintained, please feel free to use it. I hope the car will be of use in your work," it said, according to a Sina Weibo post by the Fire and Rescue Bureau of the Ministry of Emergency Management. The letter was signed by "Sichuan citizen". The officers found the donor, a secondhand car seller from Sichuan, thanked him and eventually talked him into taking back his car, according to the ministry. As the gifts and heartwarming notes have become a trending topic on social media, experts said the enhancement of people's fire safety and prevention awareness will help ease firefighters' burden and better protect their safety. 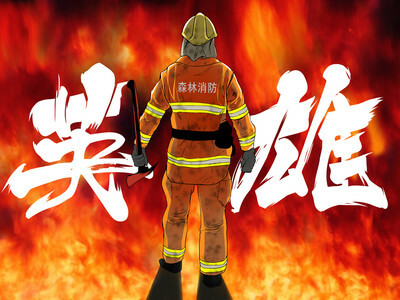 "People are now becoming more alert to fire hazards since the government has stepped up its efforts to improve public awareness of fire safety through brochures, advertisements and public service announcements," said Liu Xingye, secretary-general of the China Association for Disaster Prevention. Still, quite a few fires broke out during the Tomb Sweeping Day holiday late last week due to people's carelessness, Liu said. That shows that there is a dire need to educate the public on the dangers of even a small fire, Liu said, adding that only when there are fewer fires will firefighters be truly protected.